DiamonDyze™ is a breakthrough in Type II colored and Type III hard anodizing. The advanced ceramic formulation provides the applicator with the ability to color anodize parts AND impart extreme wear, thermal, chemical and corrosion resistance in one simple step. Colored anodizing has several advantages compared to hard anodizing. It uses less hazardous materials, uses less energy and provides a smoother, less porous surface with good chemical and corrosion resistance. However until now the only way to have extreme wear resistance was to turn to hard anodizing. Hard anodizing does create a very hard and durable surface but at the expense of the qualities that make colored anodizing so popular. NOW DiamonDyze™ combines the best features of both. DiamonDyze™ is simply added at the step where color would normally be imparted to a part undergoing the anodizing process. 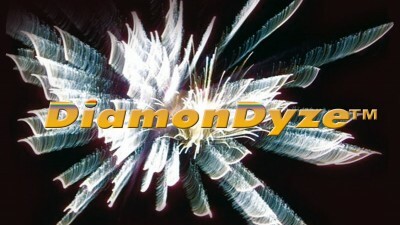 DiamonDyze™ replaces standard colored dyes in the process line. That is it. The end result is a part that can be produced in any standard color available, including shades made by mixing the colors. DiamonDyze™ then increases the chemical and corrosion protection AND adds extreme wear resistance as well as increased thermal resistance. DiamonDyze™ has proven to be so durable it has worn the teeth off files! DiamonDyze™ can be applied to almost any aluminum part that normally can be anodized. This would include pistons, aluminum cylinder heads, aluminum rocker arms, intake manifolds, turbo intake housings, shock absorbers, trailing arms, and aluminum cylinder sleeves, aluminum sprockets to name just a few. This last item is extremely important as until now the traditional hardening process for aluminum components has been extremely expensive and is available at only a few locations. Now any DiamonDyze™ licensed shop can provide this service. Existing Anodizing Shops, Machine Shops, Coating Applicators and Manufacturers will all benefit from this new and advanced technology. Our business as a Specialty Chemistry Development Company is focused on the growing need for new and improved coating technologies. We take pride in our position as The Leader in Thin Film Technology.